"We are all Putouts now"
Ummm, given the current state of Egypt's society, how would they know if this happened? And I am believing that such womanly units who wants rights as Comrade Putout, need to pass Disease Control Center inspection, first, right?? First in order is making appointment for judicious inspection of all bodily parts by Comrade Bill Lewinsky Clinton . . . I am thinking they might want to rethink they're thinking on this matter. You are right Comrade KOOK I do have a wonderful life here in the United States... thank you for reminding me! But it wasn't always so easy for me. to a fighter for women's rights in the mean streets of Kiev. I traveled to Washington recently to meet with Dear Leader™ and some of my wonderful sisters in Congress. I even got a chance to goose Dear Leader™... as you can see it put a spring in his step! We will put the "suffer" in sufferage. 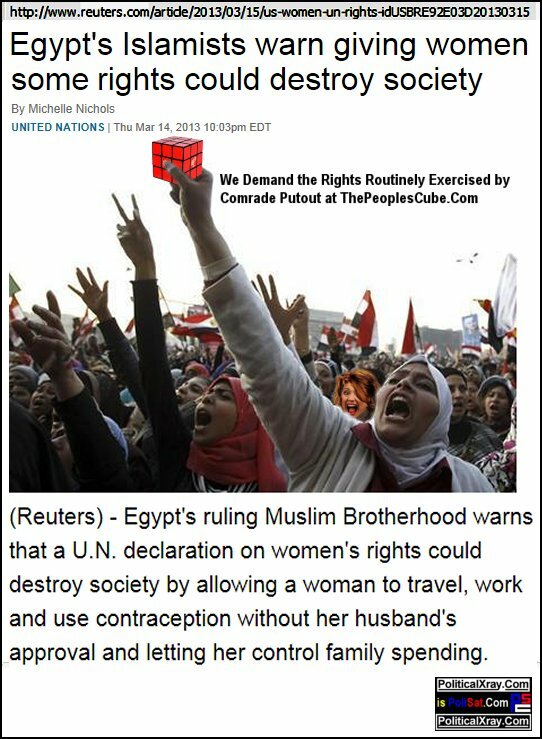 Female representatives of approximately half of the population of Egypt today protested the lack of free, government-supplied condoms in sizes that fit most Islamic men. "We're tired of those baggy, ill-fitting floppers!" screamed Fatima Fadwa Muhammada, a leader in the popular resistance. "And we want Sandra Fluke model condoms, not the cheap Egyptian camel skin ones!" Comrade Putout, how well I remember those glorious beet distributions! Many unsuspecting Hurricane Sandy victims got an eyeful, and some a handful! However, I am at a loss to correlate this with the sad plight of the Egyptian womyn - surely they, too, have done their fair of distributions, such as camel fleas during sand storms and explosives during fatwas! Do they not deserve condoms that fit their Jihad Warrior Men?? These can be ordered directly on line. You are... so I fixed it for you! I wonder what kind of a useless woman I would have become if it were not for The Peoples Comrade? THANK YOU COMRADE! Comrade Putout, so much confusion in one so young and attractive! When I get a chance I'll autograph one for you. Gender inequality at Kellogg's: demand equal peeing rights!